The Full Moon day for this month falls today, Monday, 24th September; the next Full Moon will be Wednesday, 24th October. With the ending of Summer, Autumn is beginning to reveal itself in its spectrum of colours. 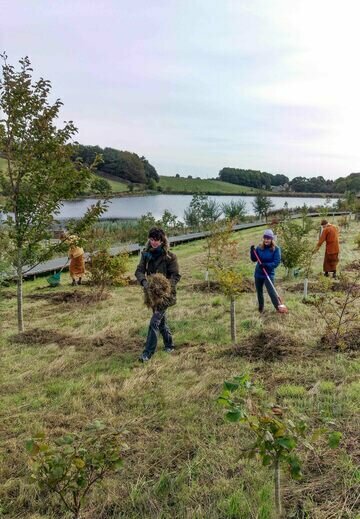 As is usual around this time of year: the contractors have been down at the lake cutting the grass which provided the resident community and a substantial amount of generous volunteers with plenty of raking to do on the lake work day last Saturday. All are welcome to join us for the next lake work day which is planned for 20th October. The new conservatories are finally complete and the remaining building work is now very close to completion after the bell tower went up. Things are also looking promising for the potential new kuti at Mangala house with construction due to begin on October 15th, likely to be completed by early November. Preparations for the October Robe Offering Festival (Pah Bah) are pressing on. This year's event will be a cooperative offering with coordinators from Thailand, Malaysia, Burma, Mongolia and Europe. You can find their contact details here. Ajahn Punnyo successfully led his annual September retreat down in Kusala house and Luang Por Munindo generously offered three talks throughout the month titled: "What Actually is Selfishness? ", "What Actually is Wisdom?" and "Commitment, Competence, Contentment".